Toyota revealed the redesigned 2014 Tundra pickup truck today at the Chicago Auto Show (CAS). After the Ford F-150, Chevy Silverado/GMS Sierra twins, and the Dodge Ram the Toyota Tundra is the 4rth most popular pickup truck in America, and it is by far the most successful truck in America from an Asian manufacturer, outselling the Nissan Titan by a 5-1 ratio. Although the Tundra is fourth in sales, the segment is massive, making up at least a third of all overall vehicle sales annually in the US. Although it is not common for Toyota to be anywhere but near the top of the list in sales, the Tundra’s impact on Toyota’s image and profits is huge. 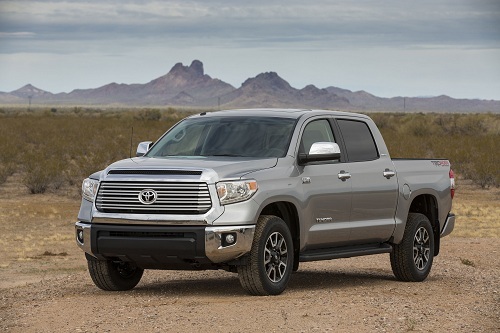 Taken together the full sized Tundra (102,000 units sold in 2012) and the Toyota Tacoma ¾ sized pickup (141,000 units sold in 2012) outsell Lexus. Not Lexus SUVs, all of Lexus in the US. Every model combined. Those sales numbers do not include the chassis sharing SUVs like the 4-runner, Sequoia and other SUVs that share much of the components of the two Toyota trucks. You can see why a new Tundra is an important announcement for Toyota. The Tundra is built in America, as trucks sold in the US must be, due to an import duty of 25%. The plant is in San Antonio, Texas. The new Tundra has a look that blends in well in this part of the US and it will continue the trend towards pickups looking big and buff. The front end has been re-styled and it is much more integrated now, looking less like a collection of parts bolted to one another. Looking at just the headlights, one can see a clear family resemblance to the Highlander and 4-Runner. The defining feature of the front end is however a horizontal air inlet at the top of the grill where it meets the hood. It looks like a power snorkel for lack of a better term. In some colors the truck looks very industrial, particularly lighter colors and silver. In black the truck looks much more like a luxury SUV on PEDs. The front fenders of the truck are more squared off compared to prior models. The chiseled look carries to the back. Following the trend others have now established, the tailgate has an integrated spoiler. For replacement cost-effectiveness both the front and rear bumpers are now three piece units. This also gives designers a bit of flexibility in creating a different look for each grade of truck. Like the bumpers that allow the different truck grades to look a bit different the CALTY design studio created a flexible interior that allows the content and theme of the interior to match the budget and priorities of the particular buyer. The rear seats of the CrewMax cab fold away for more cargo area inside the cab. The interior retains its quality and ruggedness factor. Toyota says the interior has an “Interlocked construction.” The content varies as stated, but ends up very luxurious with diamond plate leather and heated and ventilated seats on top trims. Toyota’s Entune infotainment system is available on most trims. There are multiple trim levels in the Tundra family starting with SR, and moving up as SR-5, Limited, and two separate top-level trims. Those are Platinum and 1794. The 1794 is named after the ranch where the Tundra is built in the heart of Texas. The body can be configured three ways. Two door regular cab, four door Double, and four door CrewMax. Each is available either two or four wheel drive. Taken together this line-up is pretty complete. The Tundra does not try to compete with the heaviest of contractor trucks from Ford and GM, but it pretty much does cover all the rest of the segment including most contractor’s needs. The powertrains carry over in this new truck, so we won’t spend too much time detailing each. There is the 4.0 liter V6 with a very capable 270 hp coupled to a 5 speed automatic transmission. There are two V8s. The base V8 is a 4.6 liter, 310 hp engine and the upgrade is a 5.7 liter (that is a 350 CID for those that remember) V8 with a more than capable 381 horsepower. Both V8s get a six speed automatic. The engines are available in flex fuel variants in case you live in a corn lobby state. The Tundra will now have cross traffic alert, blind spot monitoring and Smart Stop technology available. Toyota says it is also the first truck in America to have a back-up camera available on all grades. Although this author is skeptical of some of the new safety equipment offered on new vehicles due to the fact that the IIHS says they don’t reduce accidents, cross traffic alert and back-up cameras for vehicles as long as this that may be loaded above the rear window with cargo makes absolute sense. It should be mandatory. The New Tundra will not likely supplant the F-150 or Silverado from the number one and two spot, but that is not at all a bad thing. By letting those two fight for the heavy duty contractor’s market, and all the municipal bulk orders at low profit, Toyota will continue to do very well selling to those that want a truck with Toyota’s unique style. Look for the all-new Tundra on dealer lots in late summer.